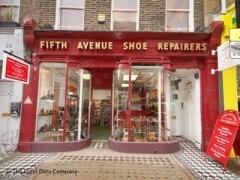 About: Fifth Avenue Shoe Repairers specialise in shoe repairs, bag repairs and key cutting. They also offer a selection of traditional mens shoes plus a range of accessories including key rings, umbrellas, shoe polish and a small selection of luggage. Cards are only accepted for retail, not repairs.